Timeouts are common in any enterprise level application. With the huge size of database and concurrent users accessing application I am sure most of you might have encountered timeouts in application. On enquiring the details of application I was informed that it was an old ASP application and the database was running in SQL Server 2005.There is a particular report which when accessed throws the timeout error. 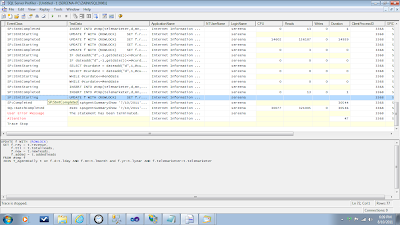 A specific stored procedure was executed for this report and the parameter was date range supplied. Like any DBA who has some knowledge on application programming and administration I thought of recommending them to increase the connection/command timeout value in connection string or IIS.But then a question flashed “Is this the best way to handle this issue?”. The answer was No. Ideally I should monitor the instance for any blocking. If there are no blockings then check the CPU and RAM utilization. 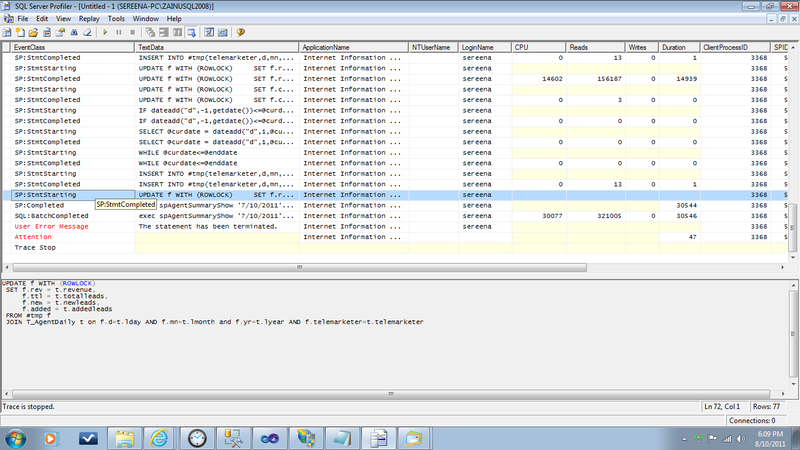 Execute a profiler and capture the statements utilizing high CPU and tune them and check if still you get timeouts or not. If still the issue persists then request network admin to start a netmon trace to check if data-packets across network are getting lost. On checking the instance for blocking (blocked processes) I couldn’t find anything. There was one more application on which I was closely working that also has the same issue of timeout but it was predominantly due to processes blocking each other. But in this instance I couldn’t find any process that was blocked. 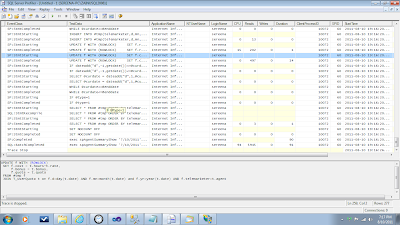 Now the next doubt was CPU or memory usage. On running the trace what I found was certainly the CPU time, reads and duration for the particular SP was high and I was able to locate the exact TSQL statement which was throwing timeout. As shown in the screenshot the update statement was creating issue. The reads were high and it was consuming high CPU cycles. This update was executed inside a while loop and the same trace file had details about the reads and CPU of previously completed update statements. Now the next part was to check the execution plan of this update statement and create appropriate indexes. I was able to find a scan on a table that was having 4313995 records. 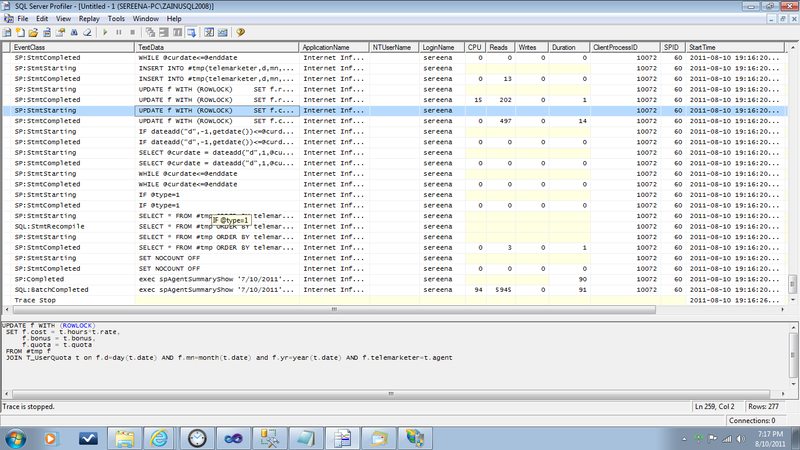 Suggested them to create non clustered indexes on this table so that the table scan was replaced by a seek. Once the indexes were created the timeout errors were resolved. On checking the trace again what I found were the CPU time was drastically reduced. This is one of the reasons for getting timeout errors. I am sure there are many other factors some of them I have explained before (blockings, network issue etc).Normally application developer thinks that these timeout are issues related to database but what I have seen is they are due to bad TSQL code or database/application design. Nice post on timeouts...keep writing zainu!!! !